Welcome to our beautiful island Kadermo where you can spend your holiday and renew yourself. Here people come together from all over the world to practice yoga and conscious self development. During your spare time you can enjoy the beautiful surrounding nature. You can try swimming in the sea or even go canoeing. Indoors, you can enjoy a coffee in our coffee shop and also relax in the sauna. In the summer season from June to August you can come to stay for a week, two weeks or as long as you like up to several months. You could also join us just for a weekend workshop. However, if possible, we recommend that you stay 2-3 weeks or longer in order for you to benefit the most from your experience. Of course, the longer you stay the more economical it is for you. During the rest of the year we arrange monthly weekend workshops. Also, longer retreats (5 days or longer) are held during Easter holidays, Christmas and other long holidays. Additionally, outside the summer period, there is teaching in Helsinki. Please contact me if you are interested. Follow this link for more events and fees! Kadermo Island offers a unique opportunity to experience yoga in a peaceful, untouched and idyllic surrounding. There are no shops or cars and hardly any other people on the island. During summertime the days are long and the sun barely sets. The retreat is set in a protected oak forest area of the island where some of the oak trees are 300-500 years old. The retreat is Stefan Engström's home for most of the year. The students are mainly lodged in a two-storey summer house on a rock overlooking the sea. It is built in an old fashioned traditional villa style that was common in the twenties. The summer house area has seven double bedrooms for guests. There is also additional lodging space in the winter house close to the yoga building. The yoga building houses two yoga halls; one for the yoga asana practice and one for silent practices and talks. The yoga building also has a library with yoga books for you to enjoy, where you are also able to do your own work, for those who may work remotely. In the cafe you can have special coffees, teas and healthy cakes. There is a free Wi-Fi connection in the library and the café area. We provide vegetarian food and the fire wood heated sauna can be used every other day. For the retreats we normally take only a small group of students in order to create a nice close-knit group and a family atmosphere. For more than 20 years, we have seen many lifelong friendships form in our retreats. The Facebook page helps people stay connected. 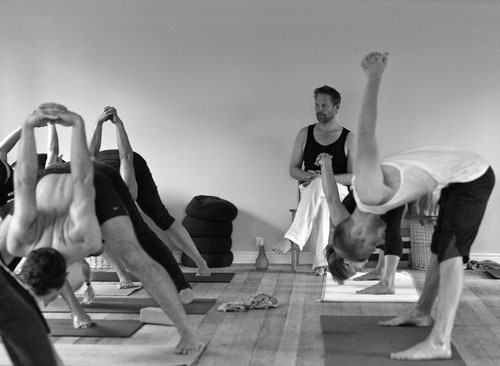 Stefan Engström is the owner and resident teacher of the Kadermo Yoga Retreat. He has been practicing Ashtanga Yoga since 1990 and Meditation since 1985. He started his practice with Radha and Derek Ireland in Greece in 1990. Then later he studied with John Scott and Graham Northfield. Since 1993 he has made more than 14 trips to Mysore, India and has spent extended periods of time studying with Pattabhi Jois, Sharath and Sarswathi. Stefan spent more than 10 years learning and practicing pranayama and other yoga-techniques with Mr. BNS Iyengar between the years 1995 to 2005. He is also a certified Mentor in Psychosynthesis. In 1994 he founded the Conscious Living Yoga Retreat (previous name: The Midnight Sun Ashtanga Yoga Retreat & Yoga, Arts and Magic) on the Island of Kadermo where he was born. Since then he has been teaching retreats and workshops on Kadermo on a yearly basis. He has also held workshops in different cities in Finland and also across Europe, Chile, Argentina and Egypt. David Gorman, renowned anatomist, Alexander Technique teacher and founder of LearningMethods, visits the island every year. He brings his latest insights and understanding of our amazing human design and function from the point of view of You, the whole thinking, feeling, responding, performing being. Yoga is a philosophy of life, which also has the potential to create a vibrantly healthy body and mind. Ashtanga yoga, practiced in its correct sequential order, gradually leads the practitioner to rediscover his or her fullest potential on all levels of human consciousness — physical, psychological, and spiritual. Read more about Ashtanga Yoga. Our approach to yoga teaching is a proactive process, taking in to count the individual's needs, abilities and uniqueness, whilst connecting with what the student already knows and can experience. All levels are welcome, also complete beginners! The goal with the different yoga practices is to achieve overall health, still mind and increased consciousness. On a deeper level, with the help of his/her own experiences and resources, the student will develop an expanded self awareness and a better understanding of their self and the world surrounding them. The teaching program consists of: Ashtanga yoga asanas, pranayama, yoga-nidra, anatomy, Psychosynthesis and talks on related subjects. Sometimes we also offer workshops on Ayurveda and Pilates.